‘Roma’ presents Cuaron’s most personal work yet – Cinema or Cine-meh? If “The Help” had stuck closer to Aibileen instead of following the lives of several characters, it would have given you an idea of what director Alfonso Cuarón was trying to accomplish when he made “Roma.” Cuarón wrote the movie as a love letter to the woman who served as his family’s housemaid in early 1970s Mexico City, and he framed it in a way that lets audiences see things from her point of view. Considering we tend to see (in film and in life) the lives of service workers from the eyes of the served, this shift was vital for telling the story in a way it’s not often told. The movie begins in medias res, with Cleo (Yalitza Aparicio) doing chores while the family—a husband and wife and their four young to pre-teen children—is out at work and school. When the father leaves for an extended business trip, Cleo has even more responsibility caring for the doting children. But a series of ups and downs (mostly downs) in Cleo’s and the family’s lives hammer home how important family—blood or not—really is for everyone in the house. Director Alfonso Cuarón (“Gravity,” “Harry Potter and the Prisoner of Azkaban”) also served as cinematographer on the film, his first time behind the camera in nearly 30 years. By the looks of it, you’d think he’d never taken a break. The camera glides through the open, sprawling house, capturing Cleo’s interactions with the building and the children, both of which she is largely responsible for. Staying mostly far back, Cuarón lets the family’s interactions with their housemaid—ranging from adorably warm to unnecessarily cold—occur naturally, as if he were a fly on the wall, as opposed to pulling in close. But rarely is Cleo off camera or too far from it. With all this time on screen, it would be reasonable to assume that Aparicio—a schoolteacher with no acting experience, who Cuarón found after an exhaustive search—might crack under the pressure. Not so. Her impressive acting debut is one of the most notable performances by any new actor this year, despite her claims that she’s “not an actor.” Thankfully, she says she’d be willing to continue acting. I hope so. “Roma” is punctuated by dark periods in Cleo’s life—or, at least, her life from circa December 1970 through roughly July of 1971. So what stood out to me as being unusual were the moments of almost ironic humor that kept popping up. A couple of side characters, especially, kept doing things with a totally straight face that I would swear were meant for a laugh. It reminded me of “Napoleon Dynamite.” I’m not sure if it was intentional, or, if so, what the intent would have been. But whether it was meaning to or not, it lightened up what was a rather scary period of time for Cleo and the family. Sometimes in a welcome way, sometimes in a bizarre way. But on the whole, “Roma” is not a fast-paced film, nor a particularly entertaining one. Many Oscar-worthy films aren’t—that’s okay as long as they tell a story, convey a deeper meaning, display technical mastery, etc. And “Roma” does that. But simply in terms of excitement or mass appeal, “Gravity” or “Harry Potter” it is not. At the end of a calendar year, like when “Roma” released on Netflix, anything short of Best Picture buzz is seen as a disappointment for some of the more critically acclaimed movies. 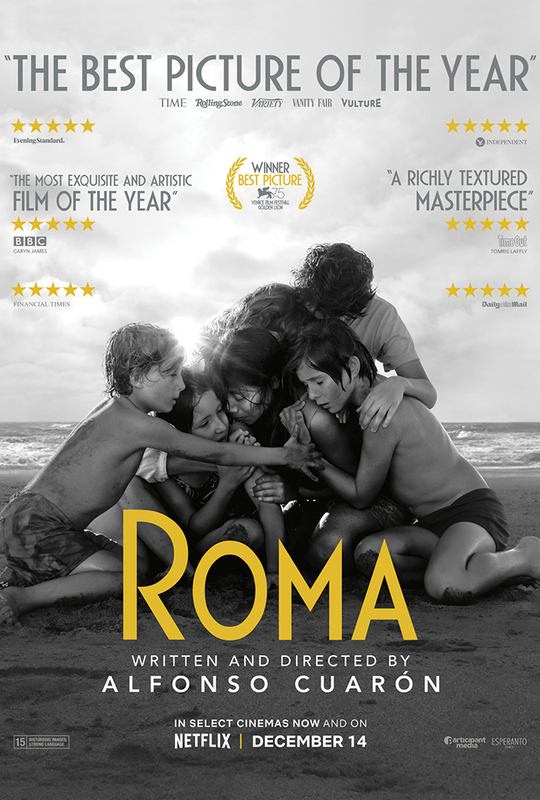 “Roma” might not be one of my Best Picture nominees if I had a ballot, but the film’s original script, Cuaron’s directing and cinematography, and a remarkable performance by Aparicio put “Roma” in a well-deserved spot to be in consideration for many other impressive Oscar categories. Plus—whether you like it or not that Netflix is in the Oscar business now—this foreign-language contender will be able to be seen by more people than other similar films. You can disagree with the reason, but it’s hard to disagree with the result.